For most gear geeks, big box stores are a disappointment. 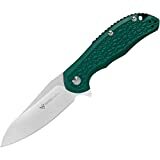 Generally the most you can expect to find are some of the nicer Kershaw models, or, if they cater to hunters and law enforcement, a few Benchmades. The one store that broke that model was Sport Chalet. In the year and a half prior to going out of business, the knife case at my local Sport Chalet expanded from the usual suspects – Kershaw, Gerber, Leatherman, a few Benchmades – to include some of the more exotic SOG knives, as well as a few offerings from a relatively new company: Steel Will. At the time, Steel Will was producing high-end backlocks and a range of fixed blades, and though the designs were attractive, I was never comfortable ponying up the $200+ dollars for a knife that was too big to carry on campus. After trying and failing to buy a Gekko 1552 on the cheap at my local Sport Chalet’s closing sale, I put the company out of mind, assuming that they wouldn’t leave much of an impact in the market. I couldn’t have been more wrong. Nick Shabazz’s review of the Cutjack caught me completely off guard, as not only was this not the Steel Will I was familiar with, but he compared it favorably to the Ontario RAT 1 and 2, both of which are stellar knives for the price. Steel Will was back on my radar, and it was only a matter of time before one of their products ended up on the review docket. As it turns out, I didn’t have long to wait. Thanks to an informal giveaway hosted by @brancon (a reader, listener, and all-around great guy), I’ve been able to tote the Steel Will Modus F25-12 around for a few months and gather my thoughts on it, which are collected below. Since I came by the Modus because of someone else’s generosity, it only makes sense to pass it along to the community. Read on to learn how you could win one of the better value knives available. The Steel Will Modus is 7.625” overall, with a 3.25” blade housed in a 4.375” handle. Though it doesn’t approach the “voodoo” territory of the Kizer Feist, the Modus does fit a wide, long blade into a fairly compact handle. There is no sense of wasted internal volume like there is with, say, the Spyderco Manix 2LW. Due to the nested, skeletonized steel liners, it’s also relatively lightweight at just 3.39 oz, and thus manages to feel stout but not bulky. Fair warning: though it may not feel like a large knife in the pocket, the blade is probably a bit too long for some office environments, and is certainly too long for some city ordinances. Size considerations aside, the profile of the Modus’s blade is one of my personal favorites, a modified sheepsfoot (which is arguably just a funky drop point). The gentle, continuous curve of the edge is perfect for everyday cutting tasks. It’s just as good at breaking down boxes as it is preparing a picnic lunch, and as most of the spine’s thickness is carried to the tip of the blade, it should be able to handle some incidental abuse without pause. In keeping with the theme of general utility, the Modus features a high flat grind. When done right, flat grinds are lean cutters that don’t get bound up in stubborn material like cardboard. Done wrong, they’re sharpened prybars. The success of any given flat grind is mostly dependent on two factors: 1.) how thick the blade stock is, and 2.) where the grind starts. A thick blade can be a fine cutter if the grind starts high enough (the Spyderco Techno is a good example), and a thin blade can be robbed of its potential if the grind starts too low (for instance, the ZT0450). The Modus has the best of both: thin blade stock, at just .11” thick, and a high flat grind. Unlike most imported value knives, the Modus does not have 8Cr13MoV stamped on the blade. Instead, its blade is made of D2, a not-quite-stainless tool steel with a reputation for toughness and edge retention. My experience with the Modus bears that reputation out. It retained a serviceable (if not outstanding) edge after breaking down a pile of boxes, and it didn’t pick up any chips during the task, either. Unfortunately, it is prone to staining, if not rusting, and I’ve gotten into the habit of wiping it down with some cleaner after carrying it for the day, whether I used it or not. The Modus’s handle is, in silhouette, a lean, organic, and slightly aggressive design. Its green FRN scales are supported by nested, skeletonized steel liners, as well as a black stainless steel backspacer. That sounds like a recipe for success, and it would have been, were it not for one problem: the handle pattern. The splotchy, mismatched flecks reek of the 1990s. If I more than glance at the handle scales, I’m immediately whisked back to the cartoons and advertisements of my youth. Despite finding the handle ugly as sin, I can’t deny that it’s ergonomically superb. The finger indexes suggest rather than demand where your fingers fall, the steel backspacer serves as a counterbalance for the heavy blade, and the generous contouring of the FRN scales ensures that there’s no truly incorrect way to hold the Modus. Even the pattern is functionally excellent, as it lends grip without creating a single hotspot. If a knife is comfortable to hold, it’s comfortable to carry, at least in my experience. The Modus’s slim profile, contoured handle, and unobtrusive weight all suggest that it should be a fine pocket companion. The pocket clip (often an afterthought for designers) is flawless, neither shredding the lip of my pocket nor making the act of stowing or retrieving it a nuisance. Unfortunately, Steel Will has the same problem with flipper tabs that Cold Steel has with, well, knives. Namely, that small isn’t a dirty word. At the risk of parroting Nick Shabazz, he was spot on in calling it a “pocket pecker”. It might as well be a woodpecker, tapping away at whatever else is floating around in my pocket. It’s not a dealbreaker, but it’s certainly not endearing. You know you’ve seen too many framelocks when a liner lock feels like a refreshing change of pace. Snide commentary aside, liner locks – this one included – are great. Compared to framelocks, liner locks are less likely to screw up the ergonomics, they’re easier to replace if something goes wrong, and they’re more than strong enough to handle whatever a rational human would use a knife for. The lock on this particular model consistently engages 30-40% of the blade tang, and there is no lock stick, lock rock, or blade play. Disengaging the lock is simple, as the locking leaf is slightly proud of the FRN scales and machined for extra grip. My quibbles aside, the Modus is a great knife, especially for the price. Its D2 blade stands head and shoulders above the hoard of budget knives and their 8Cr13MoV steel; factor in the excellent ergonomics, sturdy pocket clip, and reliable (if not great) deployment, and it’s easy to forgive the Nickelodeon-esque handle pattern and oversized flipper tab. Even so, the competition is quite stiff. Ontario’s RAT 1 and RAT 2 are highly regarded, feature the same materials, and come in at a similar price point. I suspect they’re even made in the same factory, so really, pick whichever model suits your fancy. The Kershaw Skyline is a perennial favorite, if a bit more expensive. I’d consider the 14C28N steel to be a step up from D2, but others can justifiably disagree. Still, the Skyline is a hair too nice to really abuse, and the more robust Modus is better suited to, say, a construction site. There’s always room for a knife like the Modus in someone’s toolbox. Those on a budget will appreciate that it punches above its price point, and those who’ve long since abandoned rational purchases will be happy to know that their beater knife is still a well-made tool. As stated in the introduction, I’m giving the Modus away. All you have to do is leave a comment below. A week after this post goes up, I’ll select one commenter using a random number generator, and ship the Modus out to them. Shipping is on me if the winner is within the United States. Apologies for that, but international shipping is a pain. Next up: the Tactile Turn Shaker V2. Editor: I recommend purchasing the Steel Will Modus at Amazon or BladeHQ. Please consider that buying anything through any of the links on this website helps support BladeReviews.com, and keeps the site going. Any and all support is greatly appreciated. Thank you very much. The blade geometry looks great, I’d love to add this one to my daily rotation. You just might get to! The blade is really quite good here, both the shape and the grind. Nice looking knife other than the handle. That pattern never should have left the 90s. I have yet to try a Steel Will knife but hopefully I have a chance soon. This one is homely but the D2 steel is certainly appealing. D2 is definitely an improvement over the usual 8Cr13MoV. Best of luck! Awesome Knife! I have the Steel Will Apostate, it’s a great knife, but it is huge! This is a bit more reasonable size. The Apostate is indeed a monster. What made you want something that size, if I may ask? Interesting budget knife. It looked like it even has reversable pocket clip, something that many budget knives seem to forget. It is reversible in the sense that you can swap the side the clip is on; sadly, it can’t be switched to tip down carry. Great review, blade shape reminds of CR insingo! They’re certainly similar. I can think of worse shapes to emulate! Sorry for putting this off – Your number came up! I’ll be sending you an email shortly. The D2 seems to be catching on,maybe we can finally say goodbye to 8cr13mov. I have to give one of the steel will knives a try.Maybe this one. Maybe this will be the one you try! Thanks for reading. Awesome review Grayson! Your photography and words get better with each review. Keep up the good work! I like the blade shape of the Modus but went for the Cutjack for the forward choil. It’s a great EDC, especially at the $38 they go for on BHQ. I have no idea why I thought it was on bearings, thank you for pointing that out. Must have been crossed wires from another review or something; I’ve edited the review to reflect this. Honestly, the Cutjack is more my style, but I won this one on Instagram, so beggars can’t be choosers. Do you know if they ever fixed the complaints regarding their M390 offerings? I gifted a Cutjack to my brother for Christmas and almost wanted to keep it myself. Steel Will is great with ergos from what I’ve seen. The ergos are fantastic here, and though I’m loathe to say it, the ugly handle should get partial credit. Grippy, but not in a manner that generates hotspots. I’ve been reading your reviews for some time now but have never commented, can you guess why now? I like your short and to the point reviews. You seem to cover all that’s needed in an easy read. I’ve had my eye on Steel Will knives for quite some time. Since purchasing my first Paramilitary 2 almost two years ago, as of now, I may have found that “one knife” and haven’t bought anything since. I still read knife reviews almost daily though and want more knives but can’t really justify the purchase. Right now I carry the PM2 daily, and for certain circumstances my Spyderco dragonfly. I’m not a Spyderco fanboy by any means, these two knives just work for me at this time. I’d like to add one of these to my collection though, it would be carried to see if it stacks up to the PM2, or as an alternate for special occasions, if not I may pass it on, or keep it along with the rest of my knives that have not seen much use since the PM2 purchase. Thanks for your time and the information you pass on. First of all, thanks for reading, and the kind words. I’m always glad to hear that someone is enjoying them! Second, I can’t blame anyone for only having one or two knives, and your two seem to be the pick of the litter. Third, you certainly don’t have to justify wanting more knives to me…my wallet has certainly seen better days. Really interesting review – I haven’t owned a knife with D2 steel. Am curious how it compares to 154CM? 154cm is one of my favorite steels, and I’d put it in a higher tier than this batch of D2. In my experience, it’s easier to sharpen, is more rust resistant, and takes a keener edge. I think that this is a beautiful knife, and I love the handle. Very nice. Well if it ends up with you, I know it’ll be appreciated. Thanks for reading! I’m surprised no one has mentioned how similar this is to the ZT 0770. Lots of companies recently have been adopting this blade shape and for good reason. I am still waffling between this and the Rat/Zancudo line for my new cousin in law. Trying to get him away from no name steel and into the deeper end of the pool. The blade shape is similar, but the handle shape seems to be a clear difference. Honestly, the more companies that adopt this the better. The Modus is good, but I have to admit that the Rat 2 in D2 is very tempting. Thanks for the review and the chance to win an interesting knife. The company and steel both seem like compelling options in a segment of the market that hasn’t seen enough attention for the last few years. Thanks for reading, and I agree: it’s very refreshing to see new releases in this part of the market. The blade shape reminds me of a Benchmade Griptilian. I enjoy your reviews. Thanks for the opportunity to get a knife. Great minds think alike, perhaps? I agree with the griptillian remark. I tend to prefer Benchmade knives (a grip was my gateway) and am curious to see how this stacks up. It’s definitely not as nice as a Benchmade (at least one they bothered to put through QC), but it’s still a great value proposition. I can put this through tasks I wouldn’t dare with a Benchmade just because of the cost difference. Say what you will about the pattern on the Modus’ scales, but I find it grabs less and puts less wear on the pocket compared to the cross pattern on the FRN Cutjack. Ugly? Maybe, but that’s kind of subjective. Practical? Absolutely, in my opinion. I personally welcomed the change myself. That aside, this was a great review and I think the majority of your assessment was quite fair and accurate. Thanks for taking the time to write it. I can’t disagree. That was the conclusion I came to in the review, after all. Nice review! I have enough nice knives at this point that I’m rarely tempted by budget blades any more but I really like the blade shape of this model and everyone seems to recommend Steel Will. I might have to give one a shot sometime. I own one in blue and absolutely love it. Though I screwed up in reprofiling the blade, marring the satin finish, somehow I got an exceedingly sharp edge. The blade belly makes a great slicer and is attractive as well. I’ve considered buying another but decided not to, as the knife is still better than I am. Great review as always Grayson. It’s good to see more excellent budget options out there. Thanks for the review. I always appreciate in depth reviews. I need a giveaway knife. I’ve never won anything in my life. Very nice article. This is a great review that I found to be very informative. So much that it influenced my decision to buy one. I’m not sure how this knife came on my scope but i do know that the manufacturer has been featured on the EDC page that I get emails from daily. It’s also possible that it came across my amazon feed because I do search for D2 blades a lot. Either way I liked what was being said about this knife here and there so I wanted to try it. After about a month of daily carry I don’t think I could be much happier. The size is just right for all day anywhere carry and the blade shape is among my most favored. You can even wear this knife with beach shorts, but I’m not sure how the D2 steel will handle that. The M390 version would probably tolerate it better pre oiling the blade and hardware would probably go a long way. I work light construction and am a prior service helicopter power train technician and jet engine mechanic who owns and uses a lot of woodworking and automotive tools constantly. Additionally I am into a lot of outdoors activities. So as you can imagine, this knife does get well used just like any knife I ever own. I am very happy with how it feels in hand and pocket as well as the blade performance. I like it so much I am getting the M390 version for myself as a birthday present. Thanks for taking the time to do such a good review. I bought a D2 Modus to see if all the hype is deserved — it is. Thanks for another entertaining review.